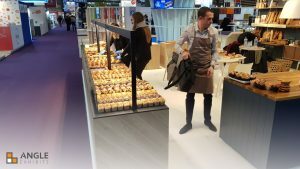 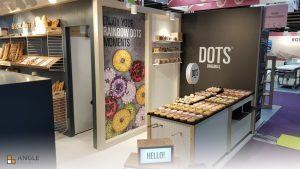 Sirha 2019 - Eurexpo (Lyon) | Angle Exhibits - Desing, build, install, Stands, Retail, Events, Europe. 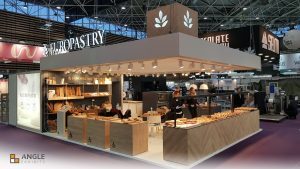 We have been in Sirha, Eurexpo (Lyon) assembling the third great stand of January for our clients, in this stand we have reused of part of the furniture that was exposed the previous week in Rimini (Sigep). 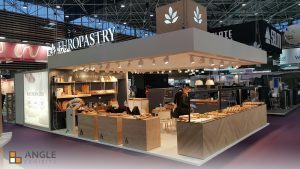 Once again we hope that our customers will have a good exhibition. 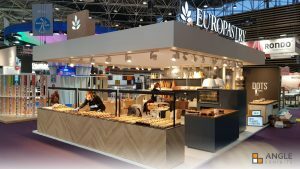 Once the event is over, we will dismantle the stand and transport it to our facilities in Barcelona so that we can continue to reuse as many elements as possible and continue to assemble our client’s stands throughout Europe.